I have another Cosmoprof goodie for you today. This one is made my Northern Star Polish. Unfortunately, this particular polish was an exclusive for the Cosmoprof event. I wanted to share it with you anyways so you get an idea of what Northern Star has to offer and what I think about the product. 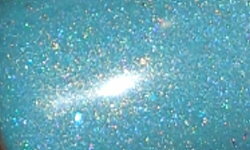 Mermaid Dream is a muted teal holo with some teal glitters. Color: Mermaid Dream is beautiful and dusty shade of teal. I love dusty shades and it's something I've been really craving in nail polish lately. This is a gorgeous and flattering color. The holo effect is beautiful and I love the touch of the teal glitters. Formula: Do you ever try a new nail polish and from first swipe of your brush on your nail you know it's a winner? There is a difference in my world from a good formula and spectacular one. This is one of the best formulas I've ever tried. The formula is creamy, smooth, and applies effortlessly. A spectacular formula stands out because I rarely need to do any cleanup afterwards on my nail. This formula is perfection. Price: This particular polish isn't available for purchase, but you can check out the rest of Northern Star's stock on their etsy site. The polishes run between $8.50-$9.00. Overall: Mermaid Dream blew me away. It is so well made. I did not doubt it at all, but you get used to how some polishes perform formula wise. That becomes you new norm and standard, until one with a formula like this comes along and it blows your mind. This color is stunning. The formula is one of the best ever. Northern Star Polish will definitely be a brand I will be shopping from in the future.